The Funky Felter: A Happy Customer, Her Sweet Handmade Felted Creation, and a Super Blog Contest Giveaway! 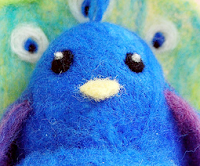 A Happy Customer, Her Sweet Handmade Felted Creation, and a Super Blog Contest Giveaway! Recently, a very nice customer, Marigold, purchased one of my large size needle felting kits. She contacted me to let me know that she'd felted up a woolly creation named Argus. I must say that I LOVE the little guy! And, to top it all off, she's giving him away! Please visit her blog for a better look at him and to enter for a chance to win him too. Sweeeeeet!